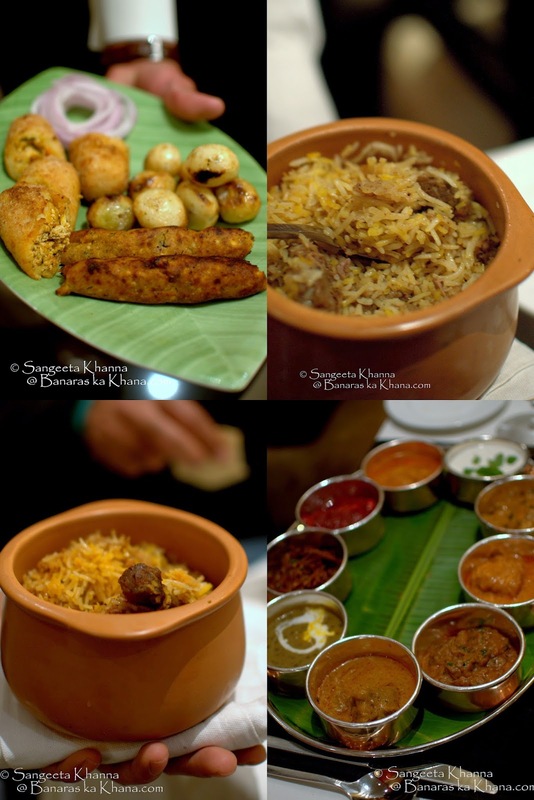 Awadhi food is close to my heart as I have spent a major chunk of my growing up years in Banaras and even the vegetarian food there has the Mughlai Awadhi influence. Probably it was the geographical region that influenced the Awadhi Mughlai and made it richer with milk products, ghee and nuts making the spicing milder and more aromatic together. The origin of all Mughlai cuisine offshoots spread across the country is Persia as Dr. Izzat Hussain says, adding that the essence of Mughlai cuisine was preserved best in Awadh region. I think it was also because of the climatic and geographical attributes of this region where milk, khoya and ghee were used abundantly since time immemorial. I met Dr. Izzat Hussain at Trident, Gurgaon last week where he is training and showcasing his own rendition of Awadhi Mughlai cuisine that he has developed over the years with his knowledge of Unani medicine combined with the love for food. We went there for dinner and Dr. Hussain greeted us with his trademark cheeky smile, then we settled down with some pineapple juice with ginger and talked about spices and herbs, condiments, cooking oils, ghee and everything that has a possible connection with food. He believes in using only as much spice and herbs in a recipe as is required for good health and digestion and that was the essence of everyday cooking in older days too. My choice of pineapple and ginger juice mix was an effort to be prepared for a heavy meal. Recently The Oberoi Group conducted an Indian culinary conclave by the name of Rivaayat and invited noted food historians, food critics and culinary experts to educate and train 32 senior most Chefs working with the group flown in from all over India. This is a great effort to preserve a culinary legacy and make a richer repertoire keeping the authenticity intact. Dr. Izzat Hussain's contribution to the Rivaayat is quite a wide range of kababs, kormas, rotis and biryanis and a few fine techniques that Chef Sandeep (from Saffron) finds useful. Many of these recipes will be included in the menu of Saffron, an eclectic Indian restaurant at Trident Gurgaon glowing with vibrant red and golden hues, massive Doric pillars and live instrumental Hindustani music. 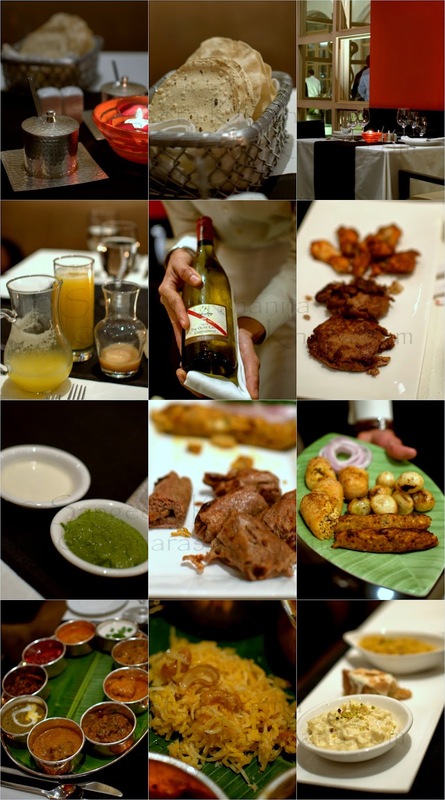 As we sampled Galouti kabab and Kakori kabab, both cooked excellently. I asked Dr, Hussain about the origin of kakori kababs and he mentioned the place called Kakori closer to Lucknow. A cook named Golu miyan used to make kababs and to prevent the kababs from falling off the seekh, he tried a coating of egg whites that binds the soft and delicate kabab so well that it sticks to the seekh till cooked. The uncoated version is tied with thread and is called dora kabab. Dr. Hussain has created a few vegetarian kababs too and they were good. I liked the paneer seekh, the mixed vegetable kabab enclosed in rice dough and bhuna aloo. I found the chutneys interesting as he introduced thoum and olive and coriander greens chutney. Thoum (or Toum) was made less pungent by adding cream and olive coriander was made almost like pesto. I had never seen olives being used in Awadhi cuisine but Dr. Hussain revealed that the Nawabs of Awadh always had access to the finest olives, zereshk berries, dates and spices imported from Iran and Persia and their use was common in royal kitchens. Something we never find in the street foods we eat at Tundey's or Dastrakhwan in Lucknow. The platter that came for mains was huge with both vegetarian and non vegetarian options for tasting. I loved the Saffron special daal (a specialty of Saffron), which is a light masoor ki daal garnished with cream and saffron. The best non vegetarian curry I liked was malai boti kabab (curried) which was delicately flavoured and cooked really soft. I liked the shahi nihari as well. Nihari is eaten with gilafi kulcha in Lucknow and it was made well. The Baqarkhani roti was also made really well but I cannot eat breads so just took one bite from each. But I ate a good portion of Izzat ki roti which is a specialty of Dr. Hussain and it is really good multi grain roti. The only grudge I have with this meal is the use of refined soybean oil for cooking. It is sacrilege for all traditional Indian cooking and health wise too. 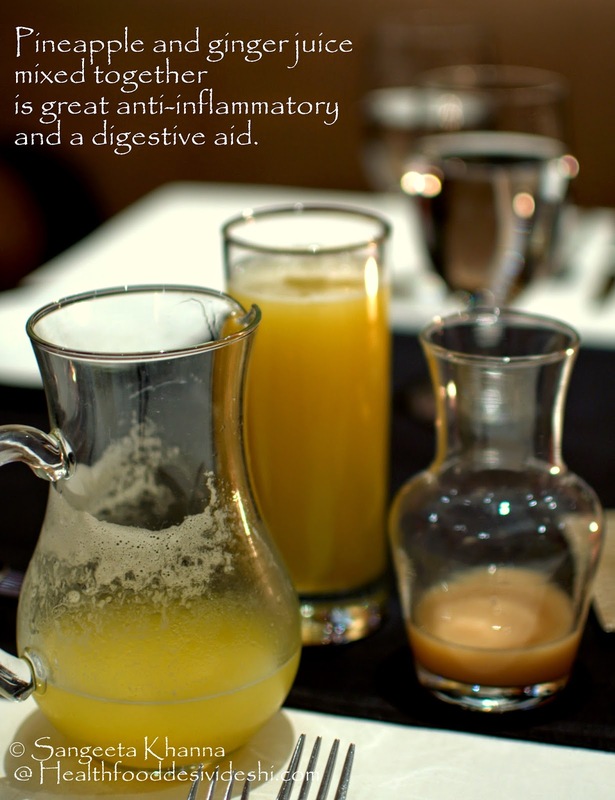 Ghee and mustard oil and other traditionally used cold pressed oils make so much difference in the final taste and healing properties of food as well. A vegetarian kaju biryani was light and delicate, although just like a pulao. The gosht biryani had familiar aromatic flavours while the murgh tursh pulao was a bit tart but interesting. I would have liked the biryanis if served as a meal and not as a part of this huge spread. I was definitely full by then. 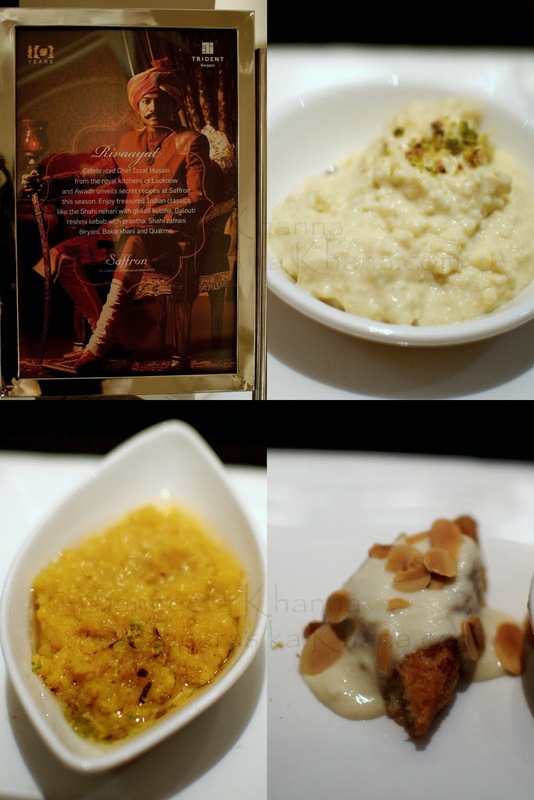 The desserts had the typical awadh signature. Tar halwa is a semolina halwa that is drowned in ghee, cooked with only milk and nuts this halwa is quite rich but somehow not my favourite. I liked the chhena kheer which was done really well and the shahi tukda that had raisins and nuts in the dense bread that is baked specially for this shahi tukda. 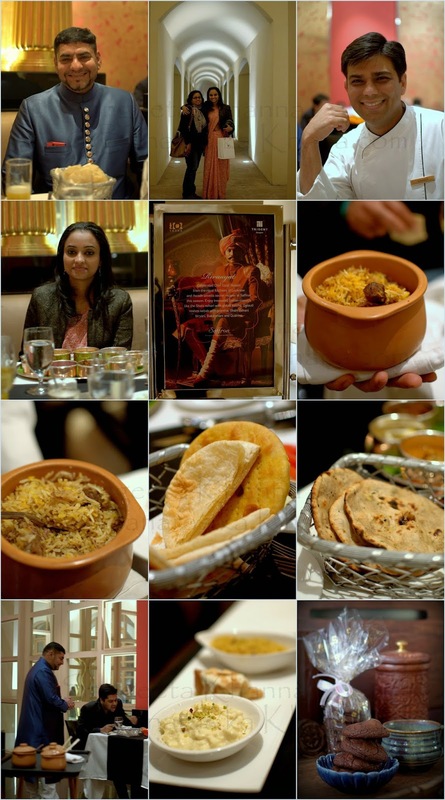 Mallika Gowda ( Manage communications) joined us for the dinner as well and introduced us to the whole concept of Rivaayat and how Oberoi group is taking it forward with their properties all over India so the signature recipes remain the same all over. 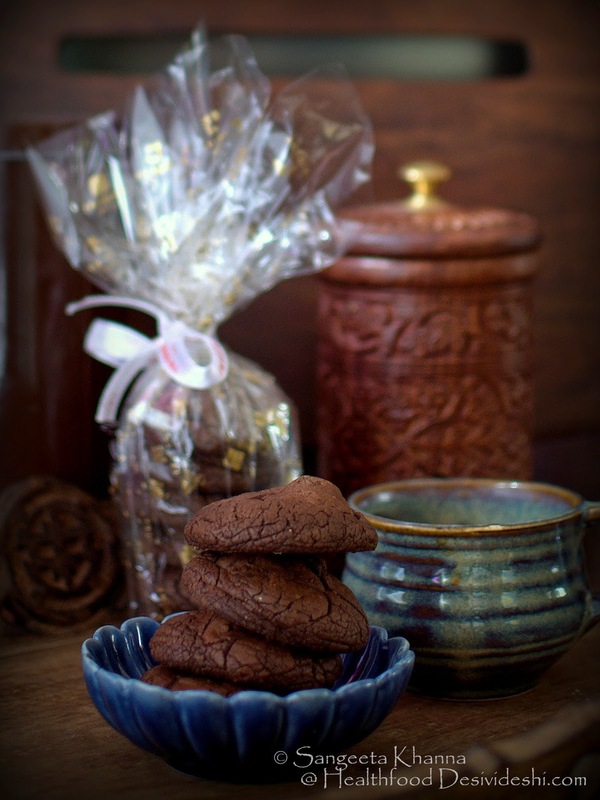 Chef Sandeep's rich fudge like chocolate cookies were the parting gift that came with an instruction to be microwaved for a few seconds before eating. I agree, rich chocolate is best enjoyed slightly warm. I am sharing the recipe of Izzat ki roti that Dr. Hussain shared with me so graciously. 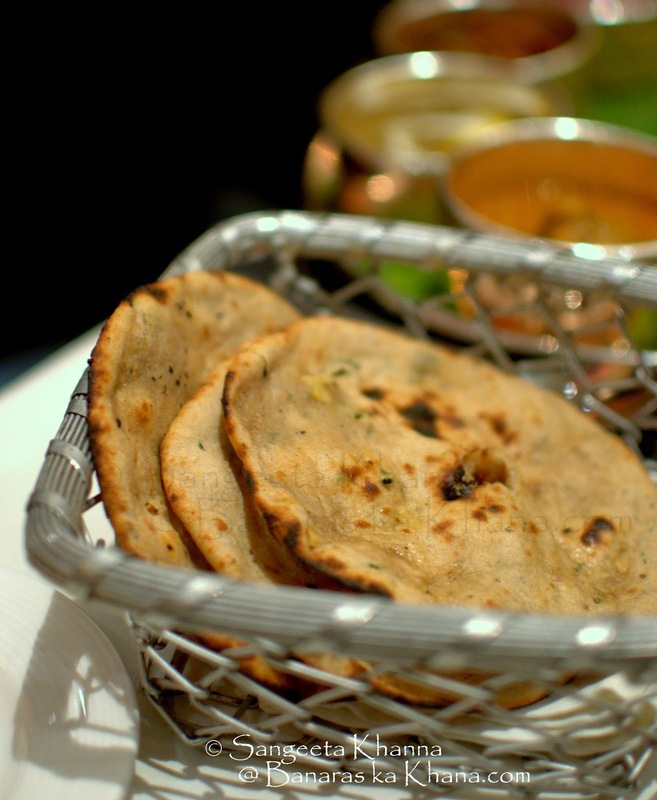 It is a multi grain roti cooked with a few seasonal herbs and light spices and served with curries and kormas. Mix the flours, the herbs, the spices and the ghee and salt. Mix well by rubbing together and knead a firm dough using warm water. Let it rest for half an hour and then make flat breads as you like. Smear ghee or butter as per liking and serve as required.